Deveneys of Dundrum: Red Branch, Hard Cherry Cider. 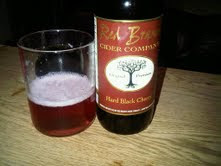 Red Branch, Hard Cherry Cider. Red Branch, Hard Cherry Cider arrived in, in a mixed case of Honey and Apple and Peach flavoured 500ml swing top bottles. Red Branch are an award winning Cider producer from Sunnyvale, California. Pretty heavily carbonated, which both myself and my Saturday night dress experienced first hand. This is definitely not girly cider. The alcohol content comes in just .1% below 7%. The nose is fresh raspberry, citrus and slightly sherbety. After the initial 'I just swallowed a Soda Stream' - my highly carbonated mouth and nose subsided- slightly uncomfortable!!. It gave way to flavours of fresh cherries, raspberries and grapefruit. Surprisingly tart with very little residual sugar evident on the finish. This is not Fruit cider as we know it. Kopparberg and Rekorderlig fans - maybe not your bag!! Ah, explosion cider... such taste, such explosions. I find the best way to make it less soda streamy (and one of the quickest ways to drink it) is to open the lid, not all the way! and using a finger to keep the seal. Then turn it upside down in your glass of choice and release slighly. The pressure will spray most of the contents in foam form on to the side of the glass, release it only a tiny amount. You have to take some breaks to let the foam settle but it's damn faster than slowly letting off the pressure for an hour and a bit cleaner than a half the bottle escaping in one go. Plus it doesn't taste like like it's mostly made of carbon dioxide. Must drop by and pick up a bottle of explosion peach. Thanks for the tip Niall, Where were you last Saturday night??? Myself and my dress could have done with some advice!!! Oh okay folks. If there is a way for me to get more cider over to the home sod I will. I'm from Sligo originally and I fear something happened in transit between California and Ireland. Let's figure out how we can get some fresh cider home to you all and I will certainly make sure that it isn't super carbonated. That would be great Mike, Sligo eh?... The home sod would much appreciate another shipment.